Welcome to the Little Wooden Booth Co - Perth's best open photo booth experience. We are here to make sure your next event is unforgettable. After some tough research and much rigorous testing (read- endless party selfies) we came up with a design for a new photo booth that blended simple, modern aesthetics with the very best in photography equipment and technology to provide you with the highest image quality. We guarantee you'll love every snap this bad boy takes. We like to keep things clean and simple. Our photo booth is an open-style, all in one free standing unit. No walls. No limits. With our open booth, everyone can join in the fun. Unlike some photo booth companies that use cameras similar to webcams, we use use professional high end camera gear and lenses that capture every moment in ultra sharp, high resolution pixel perfection. We've incorporated professional studio flash lighting which allows us to get the very best image quality possible. Not only that, but we've rigged it up to have the same light the pro's use for magazine shoots. We know what you're thinking - can you even do that?! Yeah. We just did. We use a state of the art dye sublimation printer to deliver the highest quality, smudge proof, fade resistant prints that come out in an instant. Our graphic designer can design literally anything your young heart desires. 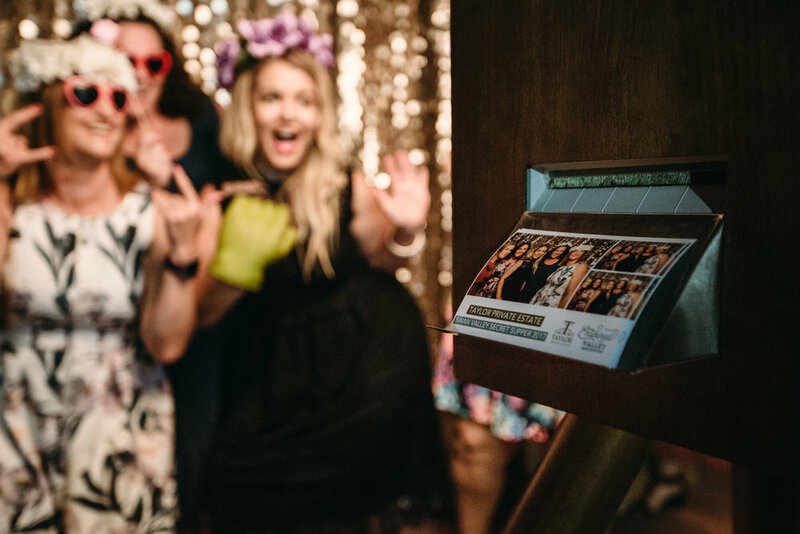 We make sure that your instant prints match your theme or event styling, creating a seamless party experience that lasts long after the guests go home. Check out the blog to see what we've created recently! We've scoured the world to bring you the very best selection of original and fun props that the other photo booth companies don't have. We regularly update our selection of props to keep things fresh and new. Having a themed party? We LOVE themed parties so much that we can make special arrangements to source props that will suit your party theme or styling to make it exactly how you imagined. Our open photo booth design means everyone can fit in the shot! Our specialised dye-sublimation printer ensures your prints are the highest quality, resistant to fading and smudging, and they come out in just 15 seconds, so there's no waiting around - just more time to get another snap! We have a huge range of different layouts available for your 2x6" photo strip prints, and to show each hilarious photo in greater detail, you can even have a 4x6" print instead at no additional cost. We believe sharing is caring, so we've made it super easy for all of your guests to find their snaps long after the party ends. a digital copy of each print out, and animated GIFs of each photo set. So go on, share the fun times! Read for yourself what our past clients have said about us! "Thank you very much for the photo booth on Sunday. Definitely one of the best photo booths I have seen. We had so much fun… Thanks again for everything"
"I would just like to say a big thank you to you and your assistant for a great night on Saturday! Everyone had a great time using the photo booth!" "Absolutely wonderful photographer who really gets into the party! I can not recommend her photo booth enough, it captured all the right memories for the evening, we will definitely be booking her again! Thanks again!" We like to keep things simple. All of our packages include everything you need to get the most out of your photo booth. After something different? Send us an email enquiry to see what we can do for you. ALL PRICES HAVE BEEN UPDATED ON 05.10.2018. PRICE IS INCLUSIVE OF GST.